The error says, “Chrome didn’t shut down correctly” followed by a button that says “Restore.” By clicking on the Restore button, I’m able to get my tabs back, but it’s kind of annoying that I have to do that. Also, there is no indication of what the problem is in the Chrome crash log (chrome://crashes), which means I really have no idea what causes this problem. I tried a bunch of suggestions from various websites to get this error to go away and finally found one that works. Here’s what you need to do. Near the bottom of the advanced settings is the option you want: System. There should be two buttons there. 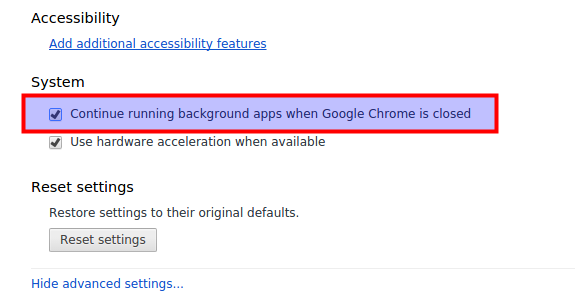 The first one says, “Continue running background apps when Google Chrome is closed.” I only get the “Chrome didn’t shut down correctly” error when that button is selected. it really solved the issue! This was the fix for me. This problem happened to me also. I experimented with what was written above. In my case it was the last extension I added to Chrome, AHA Music Identifier. 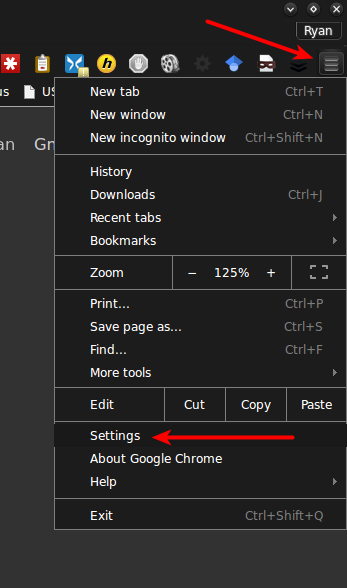 Turning off the option as written above worked, however, I removed AHA music Identifier but turned back on the option to run when Chrome is closed. Chrome worked perfectly afterwards. In my case it was a Chrome extension that was causing the problem in the first place.